Canada Dry is a brand of soft drinks owned since 2008 by the Texas-based Dr Pepper Snapple Group. 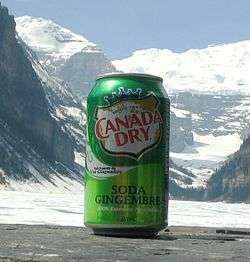 For over a century, Canada Dry has been known for its ginger ale, though the company also manufactures a number of other soft drinks and mixers. Although Canada Dry originated in Canada, it is now produced in many countries around the globe, including the United States, Mexico, Colombia, the Middle East, Europe and Japan. 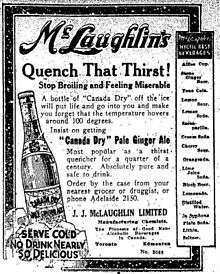 1916 Toronto Star ad for the product. In 1890, Canadian pharmacist and chemist John J. McLaughlin of Enniskillen, Ontario, after working in a soda factory in Brooklyn, New York, opened a carbonated water plant in Toronto. McLaughlin was the oldest son of Robert McLaughlin, founder of McLaughlin Carriage and McLaughlin Motor Car. In 1904, McLaughlin created "Canada Dry Pale Ginger Ale"; three years later the drink was appointed to the Royal Household of the Governor General of Canada, and the label featuring a beaver atop a map of Canada was replaced with the present Crown and shield. Canada Dry's popularity as a mixer began during Prohibition, when its flavor helped mask the taste of homemade liquor. In the 1930s, Canada Dry expanded worldwide. From the 1950s onward, the company introduced a larger number of products. Norton Simon took an interest in the company in 1964, and it merged with Simon's other holdings, the McCall Corporation and Hunt Foods, to form Norton Simon Inc. Dr Pepper bought Canada Dry from Norton Simon in 1982. In 1984, Dr Pepper was acquired by Forstmann Little & Company, and Canada Dry was sold to R. J. Reynolds' Del Monte Foods unit to pay off acquisition debt. RJR Nabisco sold its soft drink business to Cadbury Schweppes in 1986. Today, Canada Dry is owned by Dr Pepper Snapple Group, which was spun off from Cadbury Schweppes in 2008. Limited availability flavors are produced in Pennsauken Township, New Jersey, by Pepsi-Cola/National Brand Beverages and are distributed in southern New Jersey, Delaware, southeastern Pennsylvania, and eastern Maryland. At one time, the flavors all had uniquely designed labels; but now all use the standard Canada Dry crest logo. Nylon Studios produced the song used in the Rabbit's 'Jack's Farm' commercial featuring Canada Dry Ginger Ale. A Cantonese version of the ad was also produced. 1 2 3 4 "History of our Brands". Cadbury. Archived from the original on July 8, 2011. Retrieved 2010-09-11. ↑ "Ginger Ales, Seltzer Waters, Sodas | Canada Dry". www.canadadry.com. Retrieved 2016-05-28. ↑ "Canada Dry Mott's - Our History". www.canadadrymotts.ca. Retrieved 2016-05-28. ↑ Morris, Evan. From Altoids to Zima: The Surprising Stories Behind 125 Famous Brand Names. Fireside , 2004. p. 23-24. ↑ Robertson, Heather (1995-10-28). Driving Force: The McLaughlin Family and the Age of the Car. McClelland & Stewart. ISBN 0-7710-7556-1. ↑ Nader, Ralph; Nadia Milleron; Duff Conacher (1992-09-01). Canada Firsts. McClelland & Stewart. p. 96. ISBN 978-0-7710-6713-6. ↑ Witzel, Michael Karl; Gyvel Young-Witzel (May 1998). Soda pop! : from miracle medicine to pop culture. Town Square Books. p. 68. ISBN 978-0-89658-326-9. ↑ "Schweppes to Buy Nabisco's Sunkist, Canada Dry Units". latimes. Retrieved 5 April 2015. ↑ "Dr Pepper Snapple Group - Canada Dry". DrPepperSnappleGroup.com. Retrieved 5 April 2015. ↑ anonymous (April 16, 1948). "Display Ad (for Hi-Spot-the delightful lithiated lemon drink)". Daily Boston Globe. Retrieved September 8, 2013. ↑ "Dr Pepper Snapple Group Product Facts". dpsgproductfacts.com. Retrieved 21 February 2015. ↑ "The Milwaukee Journal - Google News Archive Search". google.com. Retrieved 21 February 2015. ↑ "Dr Pepper Snapple Group Product Facts". www.dpsgproductfacts.com. Retrieved 2016-05-21. ↑ "Home". Canada Dry. Retrieved 2016-05-21. ↑ "CCU - Un Mundo de Sabores » Canada Dry Limón Soda". ccu.cl. Retrieved 21 February 2015. ↑ "Nylon Studios Blogger". nylonstudios.blogspot.ca. Retrieved 21 February 2015. ↑ "Canada Dry: Jack's Ginger Farm(Cantonese Ad) 加拿大薑汁汽水廣告(廣東話版)". YouTube. 21 September 2012. Retrieved 21 February 2015. Robertson, Heather (1995). Driving Force: The McLaughlin Family and the Age of the Car. Toronto: McClelland & Stewart Ltd.
Wikimedia Commons has media related to Canada Dry. "Ginger Ale Commercial - Jack's Farm". YouTube. 12 June 2012. Retrieved 21 February 2015.